Samsung led the pile with 22 percent of the market, ahead of Xiaomi (11 percent), Oppo, Lenovo (both nine percent), and Vivo (seven percent), according to new data from analyst firm Canalys. Indian brands, once dominant, saw their collective share shrink by more than half over the past year. “In Q4 2015, Micromax, Intex and Lava took second, third and fifth place, accounting for almost 30 percent of the market. One year on and all three vendors have dropped out of the top five, with their collective share falling to around 11 percent,” Canalys said. Beyond the competitive pricing and significant marketing budgets of Chinese rivals, there’s an additional factor at play here: demonetisation. The Indian government announced a recall of 500 IR and 1,000 INR notes to counter so-called ‘black money’ in the country, and Canalys said that had a major impact on commerce, including smartphone sales. “Local brands’ target customers typically buy in cash and from independent retailers. With the short-term liquidity crunch caused by demonetization, these retailers are suffering a slowdown in consumer spending. Local vendors are losing out as retailers look to shift their stock to fast-moving, current devices,” Canalys analyst Rushabh Doshi explained. Indeed, overall sales dropped by 25 percent year-on-year to reach 11.6 million devices in Q4 2016, the analyst firm claimed. But that shouldn’t detract from the growth that Chinese phone makers have seen in India. In particular, Xiaomi, which hit $1 billion in annual revenue from India for the first time in 2016, increased its sales by 232 percent, while Lenovo increased its market share by 11 percent and Opp’s shipment totals to India increased by over 1,500 percent. It isn’t all doom and gloom for India, very much the contrary. New research from Counterpoint found that the base of smartphone users in India passed 300 million for the first time, with total shipments growing 18 percent in 2016. That’s well above the global average of three percent, and that illustrates just why Chinese brands and even Apple, which is reportedly in talks to manufacture in India, are increasing their focus on the Indian smartphone market. 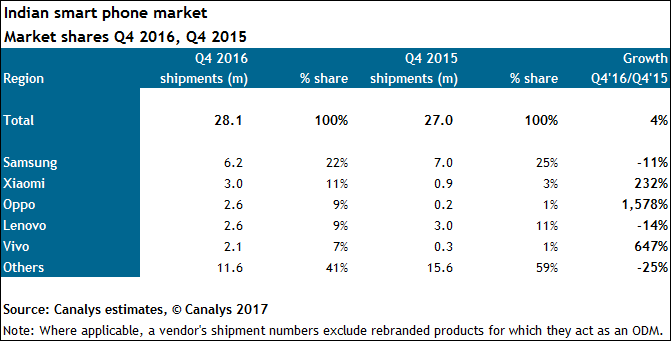 Apple, by the way, didn’t feature in the Canalys report, but Counterpoint said it had its best year in India after shipping 2.5 million iPhones. That’s up from two million last year. A big improvement but, as the charts show, it is still some way behind the field in terms of volume — though its business does account for almost all of the world’s smartphone profits so there’s that.